Can the Dream Come True Again? I don’t know if I will ever tire of watching the highlights of that FA Cup Final. I continue to be in love with the flowing football played by Roberto Martinez’s team and Ben Watson’s goal still brings tears to my eyes. It really was a dream come true. Highlights can so often paint a false picture of a game. Watching the whole ninety minutes-plus can tell a different story. But in this case the highlights were pretty close to representing a fair reflection of the match. The key moments that stick in the mind? The superb interplay early on between Callum McManaman and Arouna Kone that almost led to an early goal for the youngster; Joel Robles somehow getting his legs to Carlos Tevez’s shot that had “goal” written all over it; Shaun Maloney’s free kick that hit the crossbar; Pablo Zabalata’s red card after McManaman went bursting through; the celebrations after Watson’s goal. The statistics showed that Latics more than matched their illustrious opponents. Possession was a close 52-48 in favour of City, both teams had 12 attempts on goal. Wigan had three corners, City had five. City had three yellow cards and a red, Latics had one yellow. Incredibly for an underdog, Wigan committed only five fouls (City had eleven). Latics’ football was sublime. Who could have believed that a team built from bargain signings could compete on an equal footing with the City megastars? Will Wigan Athletic ever produce a display of such class again? How did Latics neutralize the threat of the star-studded midfield and forwards that City possessed? Latics had been playing a 3-4-3 system, but an horrendous injury situation left Martinez short of defensive options. In the event he played midfielders James McArthur and Roger Espinoza as wing backs, with James McCarthy and Jordi Gomez in the midfield holding roles. But he did have his first choice front three in Kone, McManaman and Maloney. McManaman and Watson are the names that stick in the mind, as ‘Man of the Match’ and ‘Match Winner’, but it was the performance of the back three that was the cornerstone of Latics’ victory. Antolin Alcaraz had come back from yet another injury to join Emmerson Boyce and Paul Scharner. The trio was absolutely superb in snuffing out the menace of Tevez and Aguero. So what bearing does what happened in May have on Sunday’s sixth round tie at the Etihad? City have moved on under Manuel Pellegrini and have scored forty three goals against nine in thirteen home matches in the Premier League so far this season. That would not have happened in the regime of the more defensively-minded Roberto Mancini. Moreover City thrashed Owen Coyle’s side 5-0 in a League Cup tie in September. Tevez has gone, but the Citizens now have Alvaro Negredo, Stefan Jovetic and Jesus Navas as potential threats together with Edin Dzeko and Sergio Aguero. It will be an emotional return for Uwe Rosler to the club where he made his name. However, City can count on no favours from the pragmatic German. Rosler has shown himself to be tactically astute and he will not want to play into City’s hands. More than anything he needs to nullify the threat of City’s midfield and forwards. Doubtless he will adopt the high pressing game that has become the hallmark of his tenure so far at Wigan. Stifling the service to City’s talented midfield will lessen the goal threat, but he also has to keep their forwards on a tight leash. Rosler is not afraid to vary his team’s shape and at times he has used a backline of three central defenders. It might well be his best bet in this match. An experienced central defensive three of Emmerson Boyce, Ivan Ramis and Leon Barnett is a distinct possibility. The defence becomes a back five with the wing backs – most likely James Perch and Jean Beausejour – dropping back. It is a tactic that has worked against City before. Before the FA Cup Final the question being asked of Latics’ supporters was whether they would prefer Premier League salvation or an FA Cup win. Now it is a matter of promotion back to the big league or reaching the semi-final of the Cup. 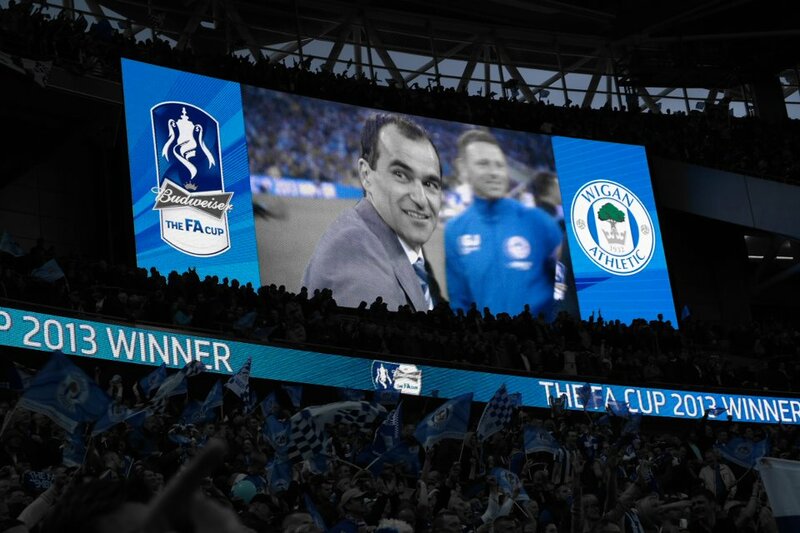 Winning the FA Cup was the best thing that ever happened to Wigan Athletic. But going out of the competition, with dignity, on Sunday would not be a tragedy with promotion a possibility. Although the odds are once again heavily stacked against Latics, only a fool would count them out.